Mazda and Hyundai are two of the biggest names in budget yet quality automobiles, and the CX-3 and Kona are two of their biggest offerings. Mazda is getting ready to ship the 2019 Mazda CX-3, while Hyundai is still selling its 2018 Kona. If you are in the market for a new SUV, you might be considering these two popular models. Right away, the new CX-3 stands out when you are comparing these two models. The stylish SUV has a sleek profile that makes it look like it’s ready to leap into action. While the Kona has a modern profile, the CX-3 is more aerodynamic and sophisticated. You’ll love the way you look in the CX-3, and you’ll turn heads wherever you go. You’ll find both midsize SUVs easy to drive and maneuver thanks to their modest proportions, but the different dimensions will influence your passenger comfort and cargo capacity. The sporty Mazda CX-3 is just slightly smaller than the Hyundai Kona on the outside, but it has comparable passenger space. The CX-3 is 168.3 inches long, 69.6 inches wide, and 60.7 inches tall. In contrast, the Kona is 164 inches long, 70.9 inches wide, and 61 inches tall. Being slightly narrower and shorter will make the CX-3 easier to get into tight spaces and make you feel more confident behind the wheel. Inside, the CX-3 has a passenger capacity of 87.6 cubic feet, compared to the Kona’s 94.1 cubic feet. Though the overall space is a bit smaller, it offers comparable personal space for passengers. For example, it has an inch less hip room in the front, slightly more leg room, and a little more than inch head room. The backseat of the CX-3 has about a half inch more leg room, about a half inch less head room, and about two inches less hip room. Overall, passengers will find they have comfortable and spacious seating in both vehicles. Cargo dimensions are also similar. The Mazda CX-3 has an overall cargo volume of 44.5 cubic feet, which is about one cubic foot less than the Hyundai Kona. Whichever SUV you choose, you’ll have enough room for your daily haul, as well as some comfortable space for trip cargo. The CX-3’s interior is designed for your comfort and convenience, and it has an upscale feel with higher-quality materials than what you’ll find in the Kona. The heads-up display and the larger 7-inch touchscreen display make it easy for you to monitor all your systems from the driver’s seat, and you’ll have easy access to controls on those displays, the steering wheel, and the center console. Bluetooth streaming, smart phone integration, voice to text, and voice-activated radio are all included in the infotainment system, helping you to play what you want and to do so safely. The 2019 Mazda CX-3 is also loaded with safety features, such as a backup camera, traction and stability control, whiplash reducing headrests, a blind-spot monitoring system, rear cross-traffic alert, automatic emergency braking, and more. While the 2018 Hyundai Kona has a respectable interior, it’s focused more on functionality than glamour. The black and gray color scheme makes the interior feel smaller and less inspiring. Seating is comfortable, but there aren’t a lot of bells and whistles. Some similar features are available, such as a heads-up display and touchscreen. However, you can’t use the touchscreen functionality while the SUV is in drive. All in all, the 2018 Hyundai Kona offers some of the same convenience and safety features, but the 2019 Mazda CX-3 ties it all together more beautifully and in a much more stylish package. When it comes to performance, the 2019 Mazda CX-3 is the clear winner, both in terms of engine power and in fuel efficiency. The CX-3 comes standard with a 2.0-liter Inline4 direct injection engine that puts out 148 horsepower and 146 lb-ft of torque. The 2018 Hyundai Kona has the same size engine, but it has sequential MPI, and it puts out 147 horsepower and 132 lb-ft of torque. You’ll feel like you have more control when you’re driving the CX-3, helping you to get in and out of tight spots quickly. Even with the more powerful engine, the Mazda CX-3 still gets better fuel efficiency than the Kona – and estimated 29 mpg in the city and 34 mpg on the highway, compared with the Kona’s estimated 27 mpg in the city and 33 mpg on the highway. The 2019 Mazda CX-3 starts at just $20,390, which is slightly more than the Kona’s starting price of $19,500. However, the difference is less than $1,000, yet the Mazda CX-3 is a much more stylish vehicle with more features, a more powerful engine, and better fuel efficiency. The CX-3 is a better deal overall, and it can be even more affordable with the right financing and specials. 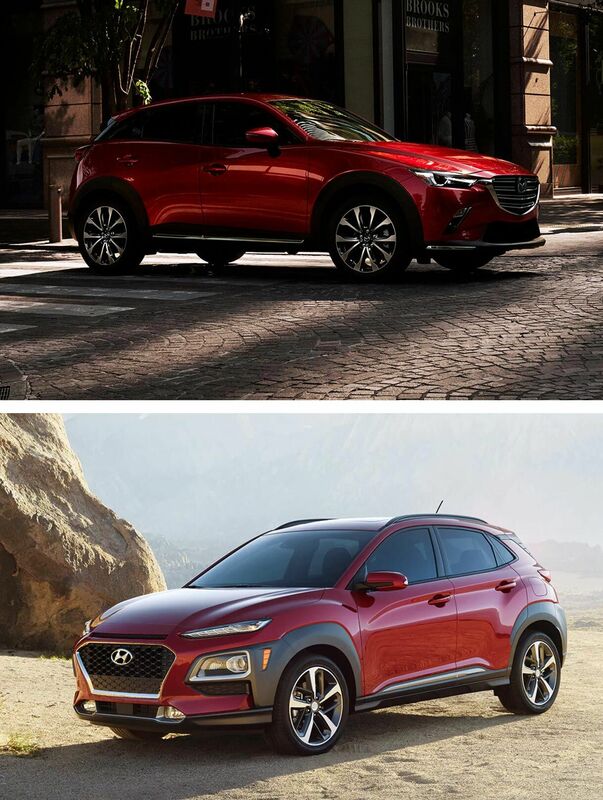 You have two great options in the 2019 Mazda CX-3 and the 2018 Hyundai Kona. But when you check out all the specs, you can see that the Mazda CX-3 is the better choice. When you take a test drive of the CX-3, you’ll fall in love with the way it handles, how comfortable it feels, and how fun all the convenience features make it to drive. You’ll also love turning heads when you drive down the street. Visit your local Mazda dealership to take a test drive of the all-new Mazda CX-3 and to learn about the specials available now. Not only could you get special discounts or extras, but you could also get great financing terms that make it even easier to fit the CX-3 into your budget. You may even have enough left to add some of the luxury features available!